Ever since watching Ted, I wanted a sequel to come out because I thought the original was so funny. Last week, I went to the cinema with my friend to watch Ted 2 and after the film we spent our Lunch discussing our thoughts and comparing it to the first. We both agreed that Ted 2 wasn't as rude in the jokes as the first but there certainly more drug references. There were also more current trend references as in posting photos on social media and the last scene which I won't ruin for those wanting to watch it. In terms of the actors/actresses, I was sad that Mila Kunis wasn't in it but Amanda Seyfried took her place and I love her too. Most of the time, I was admiring her Michael Kors bag! I thought the storyline was well developed too, my favourite scene being when they were abusing people who exercise - I thought that was brilliant. I think that Ted 2 lead on well from Ted as the start of the film is Ted's marriage which it was developing up to in the first film. The relationship between John and Ted is still as strong as ever - mainly showed by the last section of the film! Also, there is still that creepy guy after Ted which brings together the two films nicely. To say which one I preferred is hard as I thought both were very funny and entertaining. However, if you are worried that the second film won't live up to the first, don't be worried! 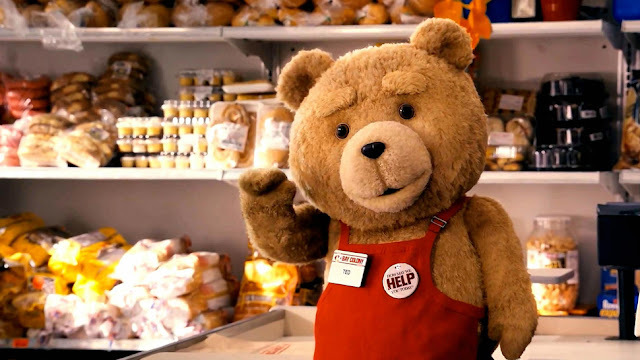 I'm secretly hoping that there will now be a Ted 3 - I have my fingers crossed!! !